According to the non-profit DAKSH, creator of the database, the information has been culled from cause lists, websites of courts, and the e-courts website. The long pendency of cases and shortage of judges are frequently discussed crises of the Indian judiciary. A first-of-its kind study has now estimated their precise magnitude — and identified, through the analyses of publicly available data, problems specific to particular courts. According to the non-profit DAKSH, creator of the database, the information has been culled from cause lists, websites of courts, and the e-courts website. Data collection began in December 2014, and as of April 1, 2016, data from 21 High Courts and 475 district courts, with more than 40 lakh case records, were collected. 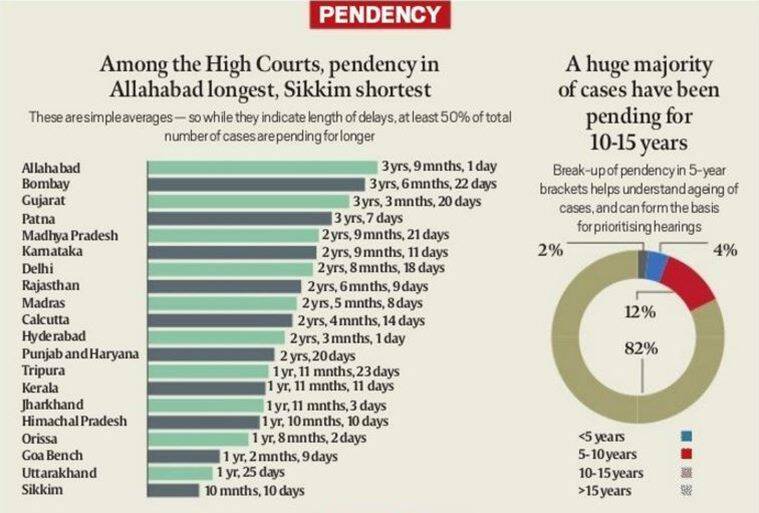 Pendency: Among the High Courts, pendency in Allahabad is the longest and Sikkim has the shortest pendency of cases. These are simple averages — so while they indicate length of delays, at least 50% of total number of cases are pending for longer. A huge majority of cases have been pending for 10-15 years. The break-up of pendency in 5-year brackets helps understand ageing of cases, and can form the basis for prioritising hearings. Case types: The survey shows that Jharkhand is the only High Court with more criminal cases than civil cases. The categorisation of cases pending in High Courts are made on the basis of their most basic distinction: civil and criminal cases. Like judges, litigants and lawyers too have to deal with multiple hearings, in both HCs and lower judiciary. 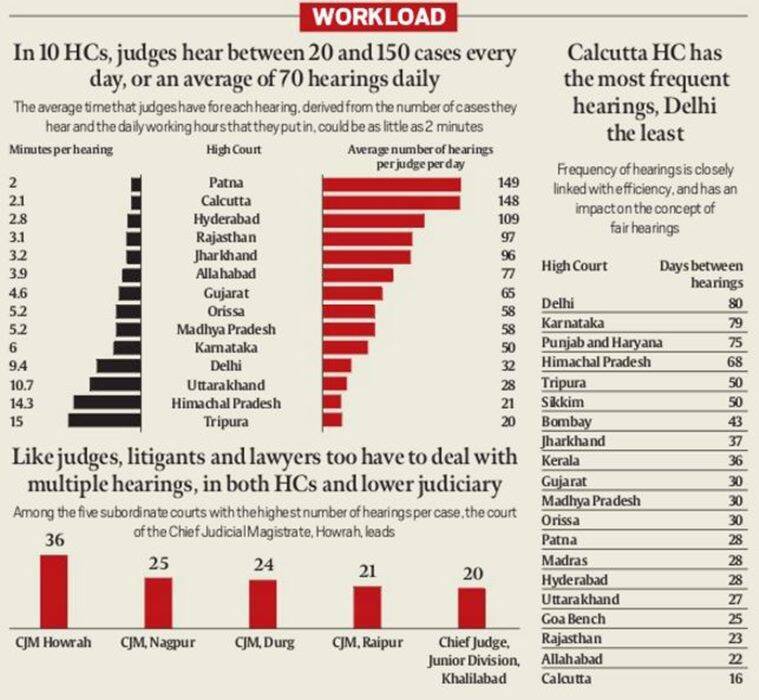 Among the five subordinate courts with the highest number of hearings per case, the court of the Chief Judicial Magistrate, Howrah, leads, followed by Nagpur and Durg. Earlier, the government had said that no new judges were appointed to the higher judiciary for eight months when the Supreme Court was deciding on the validity of a new law on appointment of judges and pointed out various causes such as increase in sanctioned strength of judges and retirements as reasons behind vacancies. Minister of State for Law P P Chaudhary told Rajya Sabha that there were vacancies in the Supreme Court and the 24 High Courts and these “mainly occurred” due to increase in the sanctioned strength of judges from 906 in June 2014 to 1079 now, resignation, death and elevation of judges. “Further, in view of the National Judicial Appointments Commission (Act) case from April, 2015 till the date of pronouncement of judgement on December 16, 2015, only those additional judges whose terms were expiring were given extension of three months as per Supreme Court orders…no other appointments were made,” he said in a written reply.